Look, up in the sky! It's a bird, it's a plane...no, it's Transporter 4! 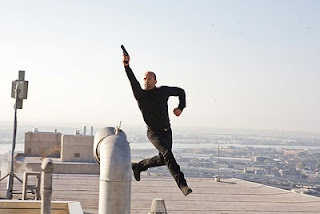 The illogical and hedonistic remake of The Mechanic, originally a 1972 Charles Bronson action-thriller, stars Jason Statham and is designed to appeal to the sort of audiences who like watching, well, Jason Statham movies. Hit-man extraordinaire Arthur Bishop (Statham) is hired to take out his mentor, Harry (Donald Sutherland, the film’s lone highlight). Haunted by latent grief, Arthur befriends Harry’s son Steve (Ben Foster) and teaches the tools of his violent trade to his new apprentice. Each lead plays to type – Statham the mindless meathead and Foster the method-acting sociopath – while their characters are blank slates devoid of any genuine emotion or rational underpinning. What’s most counterintuitive – and reprehensible – is that we’re asked to embrace a protagonist who slays his crippled father-figure and then kills and/or torments the guilty and innocent alike on some cockeyed path to absolution. Everyone is equal cannon fodder in this neo-grindhouse flick, whether they’re a gay assassin, a televangelist, a security guard’s wife and daughter, or the hapless theatergoer.